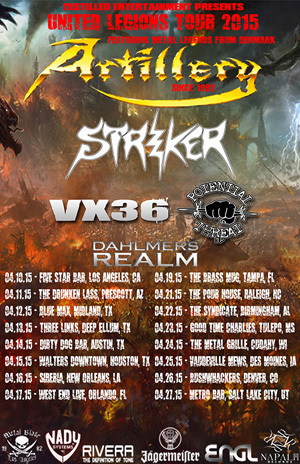 Denmark thrash metal veterans ARTILLERY will return to the US in April! The tour will also feature STRIKER and VX36 and begins on April 9th. The tour will weave its way through the US before wrapping up on April 27 in Salt Lake City, UT. For updates and info, follow ARTILLERY on Facebook at facebook.com/ARTILLERY.DK. ARTILLERY comments: "It's with a great pleasure that ARTILLERY are returning to the United States. This time as a headliner for the United Legions Tour, together With STRIKER And VX36. We can wait to play songs from Legions together with our old songs as "Terror Squad", "Khomaniac" and the "Almighty". Come and join the Legions!" ARTILLERY are one of Europe's earliest and most important exponents of thrash metal, and the band's contribution to the bourgeoning genre is difficult to ignore. The Danish quartet successfully managed to fuse an abrasive brutality with technicality and strong melodies, with the noteworthy guitar leads of the Stützer-brothers serving as highlights. Listen to music and watch videos from Legions now at metalblade.com/artillery. ARTILLERY was formed in the Copenhagen suburb of Taastrup, Denmark in 1982 by Michael and Morten Stützer. Since then ARTILLERY have gone thru numerous line-up changes and released six studio longplayers. The first period of ARTILLERY's existence gave the World the three classic albums Fear Of Tomorrow, Terror Squad and By Inheritance featuring some of the finest moments of Thrash Metal Europe has ever put out.